We rolled into Barafu camp at around 12pm. There was not a lot of flat ground to be had and tents were pitched hap-hazzardly trying to wedge in as many people as possible. 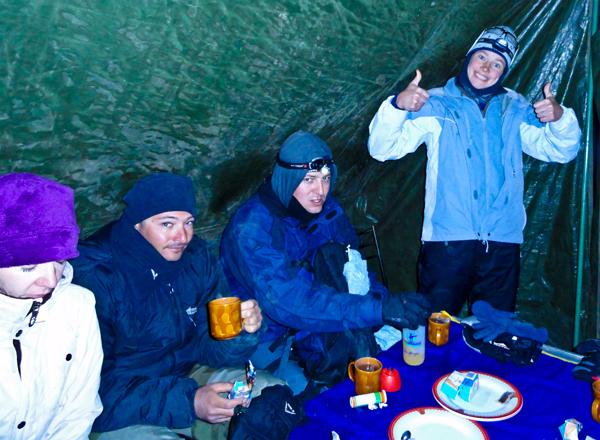 Some parties were camped for a couple of days, getting in as much acclimatising as possible. Remaining at this altitude of 4500m not only acclimatises a person better but also it is the final test to see how your body reacts thus far. Most of us were coping ok, besides David who tried running to the toilet (which was only about 20m away), felt light headed, got nauseous and had to sit down. I had no problems thus far, despite a dull ache splitting the back of my head. From Barafu the view was magnificent- there lay a great canyon below our feet. With mist constantly on the move, twirling around the camp site- like we were on the menu in a devil’s cauldron. In my mind I felt that the peaceful tranquility was akin to the Himalayas. I sat a long time on the ridge over looking the canyon and watched as more people slowly trickled in. By 3 pm we had tea and some got some valuable shut-eye or slowly perused the camp site chatting to other nomads on their journey. The Rastas were perched quite close to us with the familiar sight of large cannons in their mouths..how they made it thus far I will never know. That evening we had a carb-loaded dinner of pasta and deep fried chicken and chips- it was most delicious and saw it as a last meal before the death penalty. We had a long briefing from Tom and there was much concern from everybody on taking medication for the ascent. Diamox was the prescribed drug of choice by all the medics back on sea level, but up here, it was Tom’s word we believed in. 15 years of experience told us that it was a bad idea. 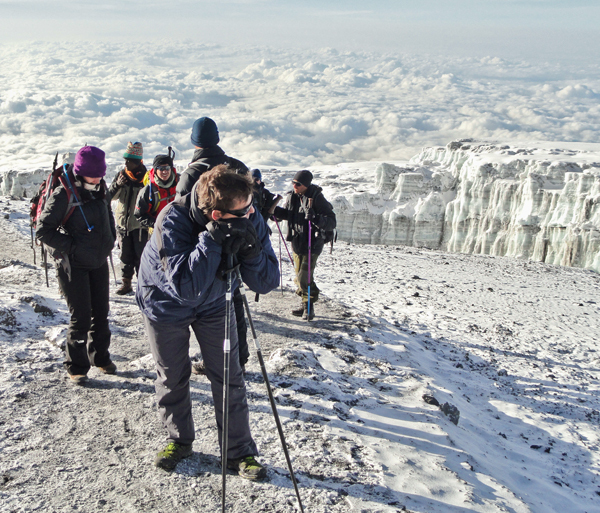 Largely masking the symptoms of high altitude sickness and even cerebral edema. The latter being the worst case scenario. Because of decreased pressure the body swells possibly causing water on the brain. I remember a bag of biltong which exploded from the pressure 2 days and 1 vertical kilometre down. The symptoms are so similar to AMS, its hard to tell the difference. Basically, If your body tells you no, then no it is. 10pm- Wake up. 10:30pm – Eat. 11pm Depart. Well it felt as though it was time to get up as soon as getting into our bags, but I managed to squash in about 2 hours! Getting geared up for the summit is mostly a planned event. With every move being a huge effort, I rummaged through duffel bags amongst 90% dirty laundry for the elusive pair without a headlamp. The bitter cold not being a plus either, the best way through was to just imagine base camp Everest: At 5000m and living in these conditions for 6 months before an single attempt can be made at the summit, made this experience seem like an enjoyable evening soiree. When all the snowmen and Michelin women finally met up at the mess-tent it became clear we were not all in the best of moods. Our midnight breakfast consisted of a pack of malt biscuits and tea with no milk- as milk makes you nauseous (or they had run out of milk and were not telling us!). We had a last minute pep talk by Tom and co-guides on what we could expect from the summit and we were on our way, headlamps on and walking poles at hand. I remember going back to put on a third pair of socks just before leaving as I couldn’t feel my baby toe- not a good sign, lets get this over and done with! Fully geared up, we departed slowly up the stony slope. Bathed in an almost full moon, we were on our way. Instructions were clear: “No overtaking”. Having left on time, we were ahead of the rest of the groups. The constant jibber-jabber and joke cracking kept us in good spirits. 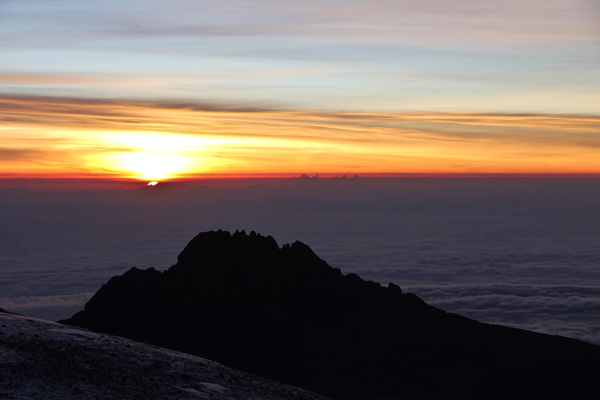 The climb was to be a 7 hour ascent to ensure us summiting for sunrise. Eventually the laughter and talking died down and was replaced by sombre out-of-breathe talk. We were focusing on one foot in front of the other at this point and had to take regular breaks to catch up on our breath. The temperature had plummeted even further and the wind had picked up. Soon snow was falling at quite a pace and the almost full-moon was now totally blacked out. We stopped to get our ponchos out- which took the better part of 15 minutes. Just as we were fumbling in our rucksacks the wind picked up even more and the snow was blowing down so hard it was almost a panic. We were caught in a blizzard. Full blown. Sitting down to wait it out, the wind was piercing our already thick outer shells and I started questioning my presence in such an awful hostile place. No life form exist up here, for good reason, and yet we actively choose to put ourselves here. Eventually the wind died down and the snow continued to gently float down. We began to press on for the remainder 3 hrs toward the summit. Every step from now on became an ever growing effort. We no longer chose to walk slowly- it was a necessity. With the headaches and nausea building slowly and icy cold taking its grip, I was beginning to feel delusional. I was humming random songs in an effort to keep my mind elsewhere. I heard someone behind me saying 5000m. I believe we have almost a vertical kilometre to climb. The time had passed really quickly in fact. It was now around 3am and we were all feeling the fatigue. The worst was the concentration. Without constantly and actively over-riding the feeling of nausea it was becoming evident it would take over your mind and it would take an unprecedented amount of effort to pull yourself out of it. In the distance I saw a lone headlamp from a weary traveler sitting down, head in hand. Further afield in the misty foreground you could hear the gag reflexes of more sickened climbers up ahead. We passed them, some kneeling down, some bent over, vomiting. It took a great deal of strength not to join their happy regurgitating spree. Passing them we patted them on the backs in common camaraderie and prayed our stomachs would hold. It was mesmerising, perhaps a scene from Auschwitz; a sobering atmosphere, like walking dead relentless in forward pursuit. Only Tom remained upright, his slow pace keeping us in line and looking into our eyes at various check points when we passed him. David, who was ahead of me in the line, suddenly pulled to one side and doubled over, vomiting. Now the rest of the party, consoling him, waited for him to recoup. He was looking bad. He was not focusing and mumbling incoherently. He was uncoordinated and had to be propped up by 2 extra guides in support. It was becoming clear that he wouldn’t make it, and the rest of the party had to press on or we would risk missing sun-up, which was now less than an hour away. The altimeter said 5600m and the pain in my head was beginning to be unbearable. I can now understand why so many people turn around at Stella Point (the first point of entry on Kibo’s cone about 5750m). This is not the summit, but near enough for some. With David left behind in the darkness, our troop slowly etched forward step by step. I, myself, was now feeling quite drunk and uncoordinated. Not focusing, just humming to myself. I prayed I would make it without letting negatives in my head. Not much longer now I thought. Sooner as unexpectedly, the light of day was beginning to open up around us. Then suddenly, the wounded line of marching prisoners of war each stepped up in turn onto the top of the cone. There were other groups shouting and laughing, dancing as best they could near to the sign reading ‘Stella Point’. It was an uplifting sight as well as invigorating to know how close we were. Then as the last member of our group stepped up to Stella, the light of day now revealed a sunrise of unparalleled beauty. I felt tears streaming down my face as the sun shone above the bed of clouds which lay beneath. A vast expanse of horizon enshrouded in clouds as far as the eye could see. We were looking at sunrise over all of Africa. How priveledged I felt to experience this majestic panorama. The ecstasy was overwhelming, all I could do was cry and gaze. I almost forgot how sick I was feeling! 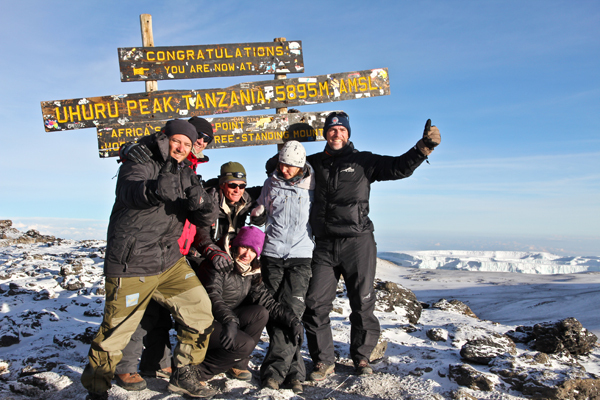 The joy was only momentary as we had to push on to the summit, which lay 1 more hour and 200m higher than us. Walking now had become easier as it no longer was vertically steep but a gentle amber around the cone. There were people already on their way down, walking back past us; some with faces that shone in happiness, others not so happy, more of a zombie expression! This is exactly how I felt! I was stooped over on my poles trudging ahead, concentrating all the time. I can truly say it was a horrible feeling. The worst hangover you can imagine as well as having 10 beers inside you! I did however manage to soak in the beauty around me. The inner cone was a plateau of snow and ice so serene and vast, like a giant ice rink with not a soul to experience it.. The route was wide open now and we walked abreast of one another. Still not focusing properly I viewed groups of people now at a point in the distance. It had taken almost an hour and it was just on 7am when we arrived at what looked like an uncompleted highway in the distance. 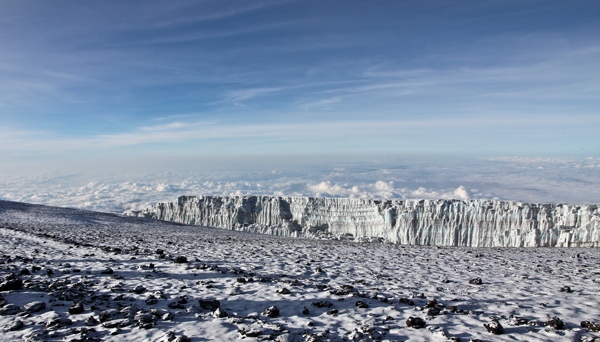 The ice-road falling off into nothingness beyond Uhuru peak. As we pulled in, the emotions were running high. People from our camp were embracing each other as well as other strangers. The crying, the laughter, the elation, was immeasurable. A surge of happiness like emerging from the depths of a river to surface after a huge plunge off a waterfall. The adrenaline was pumping and we were jumping all over each other. We had made it. 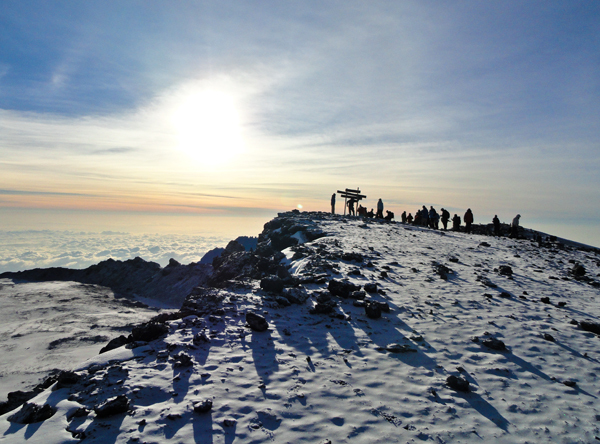 The highest point in Africa. We stood encapsulated by the awe-inspiring beauty and serenity around us. 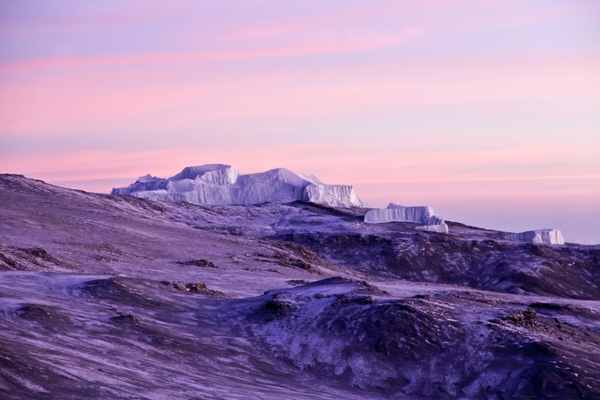 The sun, now up high in the sky shone down across a glacier which stood magically in the distance. A cool breeze, and warmth of the sun radiated through everyone. I will truly never forgot those moments. It was absolute hell to pay for this wonderment, but was indescribable. We took summit pictures by the age old weather beaten sign- and I can remember keeping my wits about me to look for a rock that was laying atop this ancient mountain to take home with me- a piece of ‘ceiling board’. This piece of volcanic rock stands proudly on the mantle piece to this day! Stella Point. Sunrise over all of Africa.